Do you want to improve your business relationships with customers, assisting in customer retention and driving sales growth? App that will help you complete access of SuiteCRM like Accounts, Contacts, Opportunities, Leads, Cases, Calls and Meetings? Then we offer you the Free Mobile CRM App for SuiteCRM. 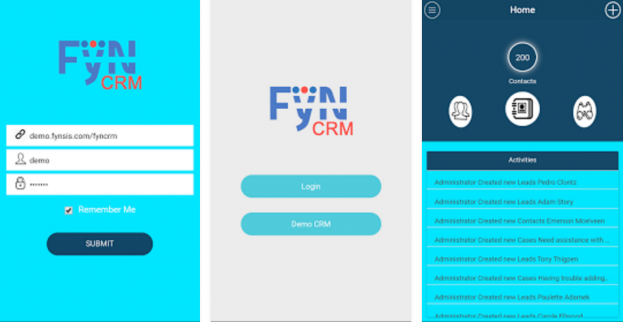 To use this app of your mobile phone you need to download it and install FyNCRM module on your CRM server. It will allow your app to access your CRM fields and sets. It will present the best business solution with an objective of creating greater professionalism and useful mobile UI to worldwide enterprises. It will track all the latest developments in your business, cooperate with your team and make the right decisions! FyNCRM for CRM will be of extreme value for the management. It can meet specific challenges of a growing field team. Will follow the all the processes of the different teams in SuiteCRM directly form the field. Also known as the best Mobile CRM App for SuiteCRM User Guide. So what are you waiting for? Improve your business and be able to access your company CRM from anywhere in the world by downloading this amazing app from Google Store or iTunes App Store.